Actual size is 1¼ x 1 in. The Rainbow Bridge Pin & Poem set is a beautiful and affordable Tribute to a beloved pet who shared their love unconditionally. The Rainbow Bridge Pin is worn in honor and memory of your beloved fur baby. 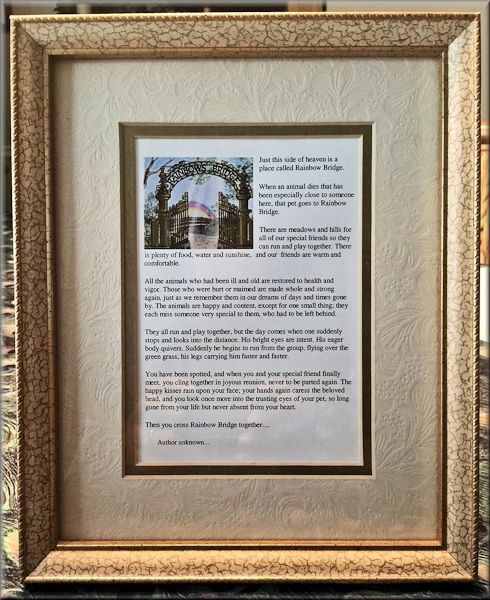 The Rainbow Bridge Poem, suited for an 8x10 matted frame, has the Rainbow Bridge Gate in the upper left corner of the poem.